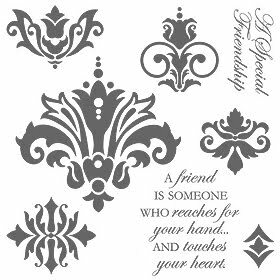 Here's another card using the February Stamp of the Month, Friendship. I love the damask look of this set! For this card, I stamped Indian Corn Blue on Indian Corn Blue cardstock for the background. I stamped the large image in second generation Indian Corn Blue. Then I stamped the quote using Outdoor Denim. Simple, yet elegant. Oh what is so beautiful card! very nice looking, and its shave is a wonderful. I like this. The picture style is very good.